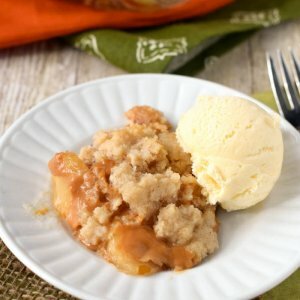 This Caramel Apple Dump Cake is ridiculously easy to make, but so delicious that it will become your new favorite fall dessert! 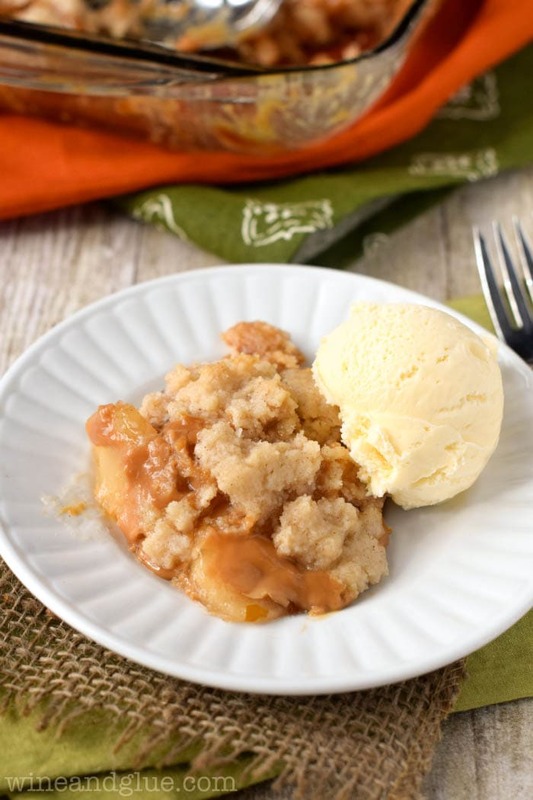 With ingredients like vanilla cake mix, evaporated milk, caramel bits, and apple pie filling, this warm and gooey treat is an absolute dream! Hi Lil’ Luna readers!! I could not be more excited to be here! 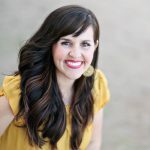 My name is Lisa and I blog over at Wine & Glue. 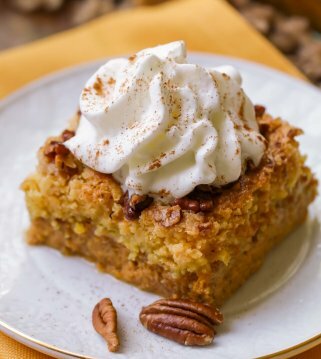 The recipe I’m sharing with you today is my FIRST official fall recipe this year and I made it especially for you guys. 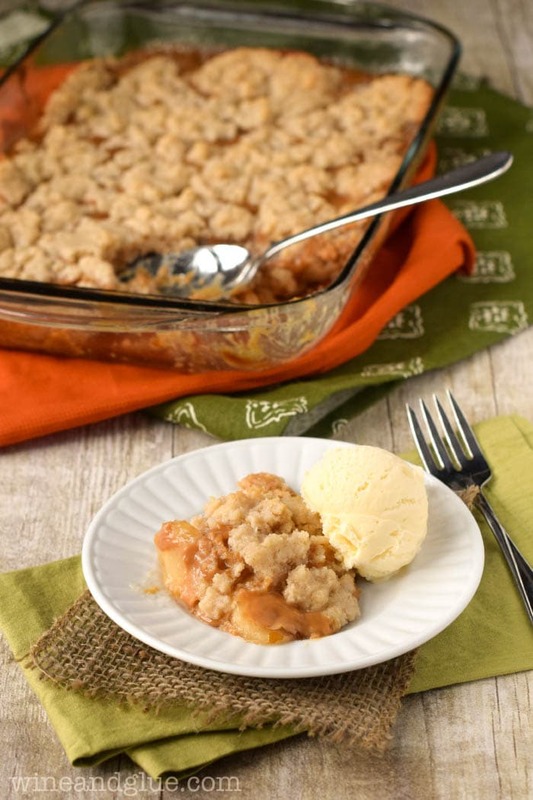 This Caramel Apple Dump Cake is all that. But I have a confession . . . . these were supposed to be bars. Ooops! I was basing these off my World’s Best Caramel Brownies that I made again recently. When I was making them, I was thinking how awesome they would be if I could just fall-ify (that’s totally a word, by the way) them. So I traded out the chocolate cake mix for vanilla, threw in some cinnamon, took the chocolate chips out and put apples in and badda bing badda boom . . . . badda mush. As soon as I took them out of the oven, I knew that they hadn’t set. So I immediately took a fork to them to give a taste to the amazing smells that were in my kitchen, and it was so good. My husband agreed, and threatened to eat the whole pan while I was putting the baby to bed. And that’s when I decided that it was just a dessert that was misunderstood. Just like you can’t force your kid to be a soccer player when they really just want to draw and build legos, you can’t force this cake to be bars. It was made to be a dump cake. And it is a glorious dump cake. Melt the caramels and 1/3 c of the evaporated milk over medium-low heat. Meanwhile, mix together the cake mix and the cinnamon until fully combined. Then add the melted butter, the vanilla and the remaining ⅓ cup evaporated milk. Divide the mixture in two. Pour the caramel over the apples and then top with clumps of the remaining cake mix. Bake for 20 to 25 more minutes or until the caramel at the edge begins to bubble and the cake at the edge begins to brown. Serve it piping hot out of the oven, with a scoop of vanilla ice cream and it is total perfection! You’re welcome. Melt together the caramels and ⅓ cup of the evaporated milk over medium low heat, stirring often. While the caramel is melting, mix together the cake mix and the cinnamon until fully combined. Then add the melted butter, the vanilla and the remaining ⅓ cup evaporated milk. Divide the mixture in two. 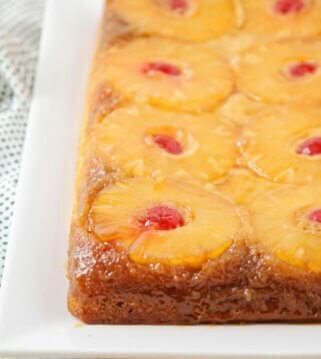 This recipe looks so good and SOOO simple! Can’t wait to try it. Thanks, Lisa! For more great recipes from her be sure to head to Wine and Glue. Same, Janet! LOVE this time of year and all the delicious baked goods!! oh yum!!!! i am so making this!!!!! 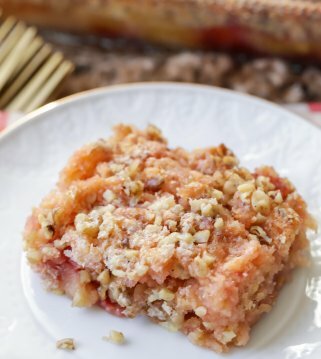 This receipe looks delicious and it is a “must add” to my files. Does anyone have any suggestions how I could modify it if I didn’t use canned apples? Would it work if I used golden delicious apples with cinnamon and sugar? I could cook them down a bit first to get that delicious gooiness that comes with canned fruit. What are your thoughts? These sound incredibly delicious and I’m differently going to try them. Can I use regular milk instead of evaporated? 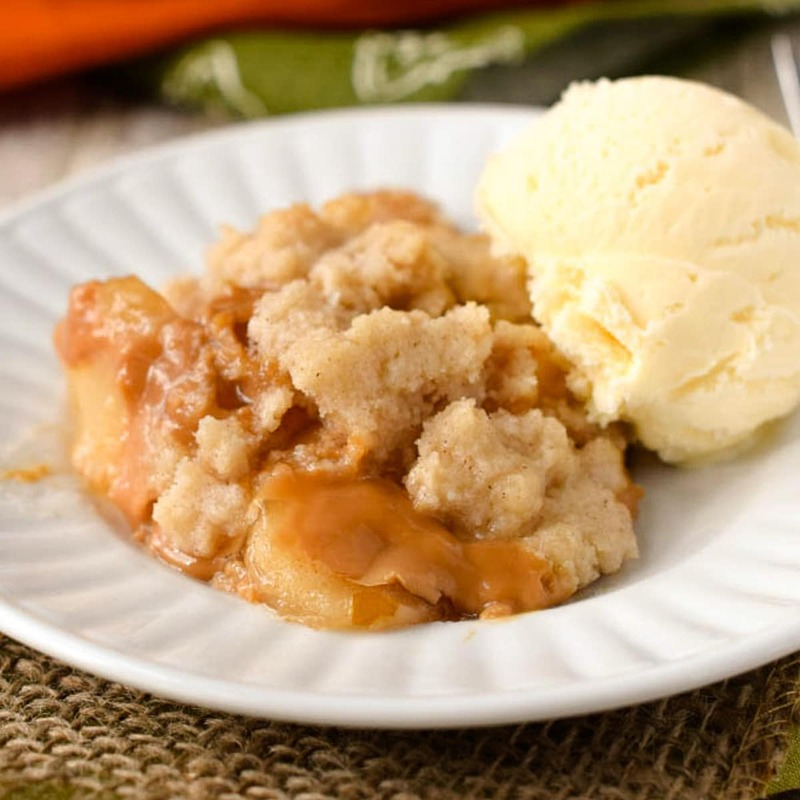 Caramel Apple Dump cake. 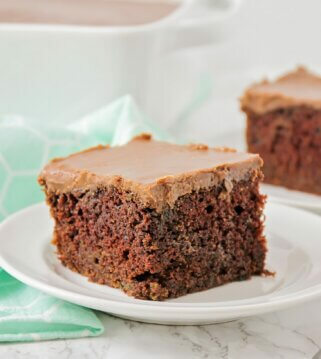 Do you add just the dry cake mix with the melted butter, cinnamon, vanilla or do you do the instructions on the back of the cake box mix (add egg, oil, & water) and then add the butter, cinnamon, vanilla? 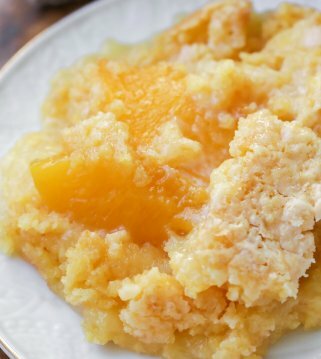 have you ever tried using oatmeal cookie mix instead- I’m out of cake mix but thought the other might make a tasty substitute. OMG!!! 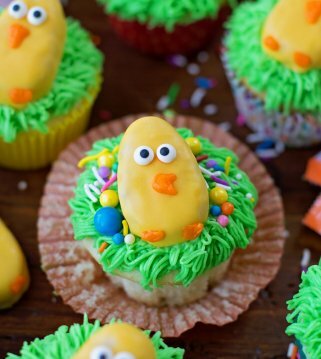 I made this for easter….OMG!!! IT was phenomenal!!!! Thank you for trying it!! I am so happy to hear that!